TheFeltim: IONSHAKER DESPERATE COVER REVEALED!!! I know I've been quiet for sometime now...but its because I've been working hard behind the scenes. 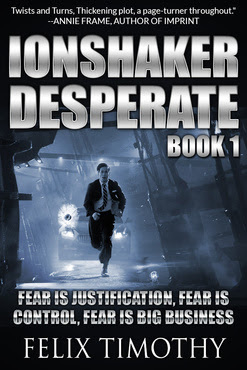 And here's the evidence of that - the IONSHAKER DESPERATE COVER. Blurb: "It is a well written book that made me want to see what happens next. The chemistry between the characters is unbelievable. There are multiple twists thrown in that I was not expecting, and with car chases, murder, and terrorism it just hit the ground running without stopping." "I enjoyed the book especially since it was a believable thriller that made me want to read more and more to find out what happens next. I loved the fact that it was in multiple viewpoints, and you can see the overall events unfold in the story. There are car chases, and people getting framed left and right all because of a program the FBI invented. Thanks Christine for connecting! Hope you visit often. Wow this was one amazing book . Felix Timothy is a truly gifted writer. This first book Ion Shaker is a great suspense thriller and I felt like this was a great work in the likes of James Patterson and Patricia Cromwell! I was taken into this great plot and it was non-stop suspense throughout! I meant to add the Ion Shaker Desperate! Thanks so much Sylvia, thanks for the nine remarks. It really means a lot.